This 26" rider scrubber is loadeed with features! It takes years of rider development and puts everything users want into a single package. 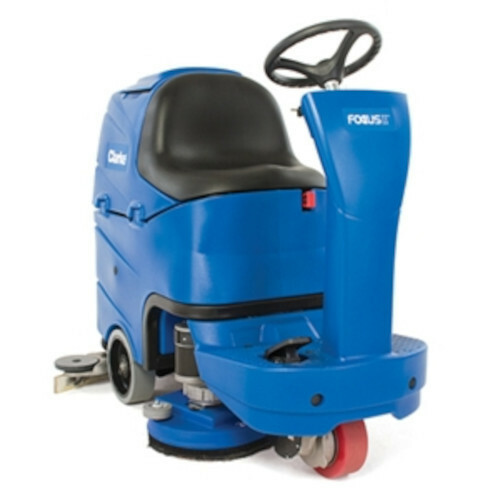 Features like drive on and off elevators, left and right shifting scrubbing deck, on board charger, adjustable on board chemical mixing, speed controlled Safe-T-steering, full access recovery tanks, in the tank debris catcher, automotive style electrical connectors, either side entry, cartridge replaced vacuum motor, front wheel drive, quite vac mode, urethane squeegee blades, 360 degree scrubbing, hour meter, just to name a few. Wet style 242Ah batteries. The 26" deck shifts left during a left turn, and shifts right during a right turn to assist the squeegee in water pickup. This allows the squeegee be more narrow (making going through doors easier) and tighter turns. During backup the blade rises automatically. Single button operation for scrub mode, adjustable down pressure, and 4 fluid rates. Set the forward speed on the display and any position of the foot pedal keeps the machine at the same speed. Rated at 45,484 square feet per hour. Run time is 3.5 hours. Also available in 28" BOOST model and without chemical mixing (see other SKUs). Not available in all areas, subject to Clarke's dealer agreements. Approximate shipping cost is $150.00, not included in pricing. Specifications subject to change. HEY LOOK -> The MFG of this item prohibits advertising this item below price shown, but if you add this item to your cart an additional $1327.65 special promotion offering will be automatically applied.